This Manaia is called ‘Rope of Mindfulness'. 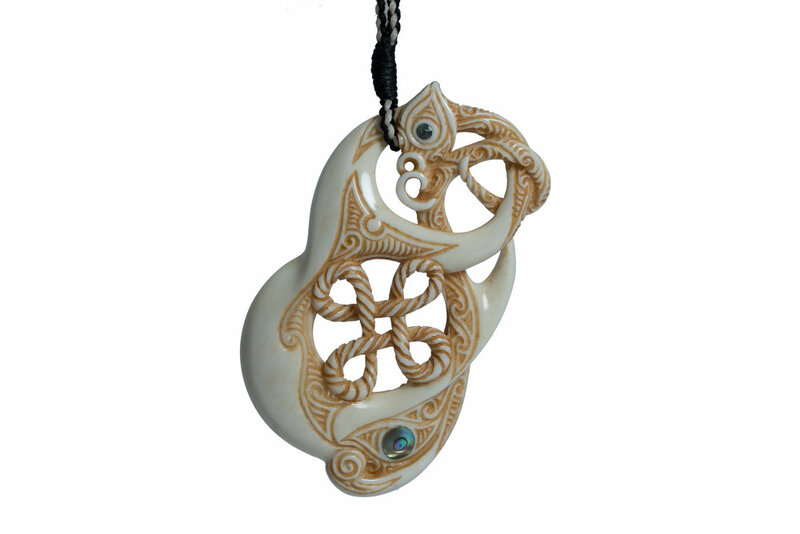 This Manaia is symbolic of the eternal nature of our mental continuum which is awakening with the joy of mindfulness. This is symbolised by the eternal knot in the centre of the carving. The awakening of deep wisdom is symbolised by the pāua eye at the base of this carving. Being at the base represents that it is a foundation upon which all our positive wishes can be achieved. A Manaia, or spiritual guardian, is the profile of a Tiki. This is symbolic of being half in this world and half in the spirit world. Manaia can be adapted with other symbols and stylized to communicate different aspects, or meanings. Mindfulness is a bit of a buzz word these days. It originates from Buddhist tenets and relates to remembering virtuous objects during meditation and as well as during our daily life. It is important to 'rope in the wild mind' using mindfulness. We do this by choosing an appropriate object to be mindful of. The most appropriate objects are those that lead us to true happiness and away from suffering. The Manaia itself 'holds' the rope mindfulness deep within itself and this is symbolic of rising above the ordinary and mundane gross minds of the lower self, and being the best that we can be by becoming aware of our true innermost nature. The koru pattern on the inside of the carving represents the inner wealth of wisdom we each possess. They also are symbolic of a journey of discovery. The koru symbol is common in New Zealand and is inspired by the unfurling of the new fern fronds. Meanings associated with this are new growth, new beginnings and awakening.